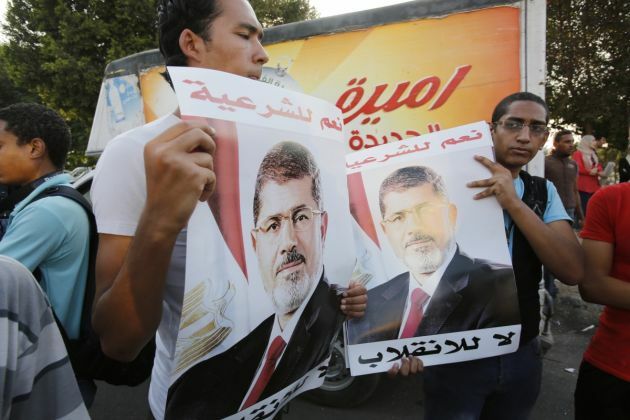 (Photo: REUTERS / Youssef Boudlal)Supporters of deposed Egyptian President Mohamed Mursi hold up posters of him during a protest along Zahara street in Cairo August 18, 2013. Egypt's army-backed rulers met on Sunday to discuss their bloody confrontation with deposed President Mohamed Mursi's Muslim Brotherhood amid contrasting proposals for compromise and a fight to the death. CAIRO (Reuters) - Normally crammed with cars and people, the chaotic streets of Cairo were strangely quiet on Thursday, with many shops still shuttered the day after security forces crushed supporters of the Muslim Brotherhood. While distraught relatives waited to claim the hundreds of dead, there was little sympathy on show for the Brotherhood among Egyptians who said the Islamists had pushed too far. The government has imposed a night-time curfew for at least a month and many people had clearly decided to stay home. Some of those who did venture out, pinned the blame on the Brothers. "We didn't want this to happen, but at the end of the day they pushed us to do it," said Mahmoud Albaz, 33, an actor and real estate agent who lives near the Brotherhood protest camp at the Rabaa al-Adawiya mosque, now blackened by fire and soot. "More than 70 percent of Egyptians are against the Brotherhood," he said. The Brotherhood won all five elections since the downfall of veteran strongman Hosni Mubarak in 2011, but Islamist President Mohamed Mursi faced accusations of incompetence during his year in office and was swept aside by the army after huge protests. Some 68 percent of those who voted for Mursi in the 2012 presidential elections came from rural areas of Egypt, according to a report by the Danish-Egyptian Dialogue Institute, while support in the big cities was always more muted. "The government had to act and intervene. In the long run it will save the lives of Egyptians," said Faris Sabhy, 44, who runs an Internet cafe on the edge of Tahrir square, the focal point of rallies that led to Mubarak's removal. "I watched it on television. I saw many guns on the side of the Muslim Brotherhood. I saw injured soldiers and thugs attacking the security forces," he said. "We are in a war." While Western media denounced Wednesday's deadly assault by armed police on protesters, newspapers and state television were full of stories of Islamist skulduggery. Coptic Christians account for about a tenth of the 84 million people living in the Arab world's most populous state. They have suffered discrimination for decades, but communal tensions and attacks rose sharply under Mursi and have continued after his overthrow. "Since June there's been a lot of sectarian violence ... I'm afraid because I don't know what will happen now," said Thabat. The Brotherhood has called for new rallies against the army-backed government, and the interior ministry has warned that security forces will use live ammunition to counter any attacks against themselves or state infrastructure. The ferocity of the crackdown on Brotherhood shocked some Egyptians. "I can't applaud the military for killing those who oppose them. They are dogs," said Rabah Zakaria, 31, a businessman in Egypt's second city of Alexandria. With no end in sight to the turmoil, some spoke openly of their despair. "Yesterday I cried. I think we're the furthest we've ever been from true reform or justice," said Sara, who declined to give her last name, describing herself as a secular activist. "I don't believe that this is going to end in one month. I think is the beginning of another 30 years of military rule."